Stamford Talk: Eat, Think, Drive, Blog! : Greenwich Nanny Craze Creeping into Stamford? The Stamford Times just published an article about isawyournany.com, a website that encourages parents to spy on other people's nannies and then post about it. You may recall that I wrote about the same site last month on Stamford Talk under the title "Blog for Paranoid Parents Across the US." 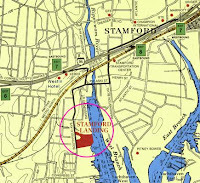 I linked to a post on a Sept. 26 sighting at Stamford's very own Crabshell Restaurant, right on the border of Old Greenwich. It turns out that the site is run out of Greenwich. Big surprise. If Greenwich is not the nanny capital of the world, please tell me what is. The Stamford Times article has some details and interviews that reveal even more about how crazy the site is... parentpaparazzi! All I can say is, as a parent, I would want to know if my nanny were doing anything wrong with my children when she thought that no one was watching. However, I can see that this site, which I have also seen, could become a haven for spiteful people. It's a tough call.